May 22, 2017 – Coming Up for Air gets 4 great reviews from Publishers Weekly, Kirkus, School Library Journal, and Romantic Times! 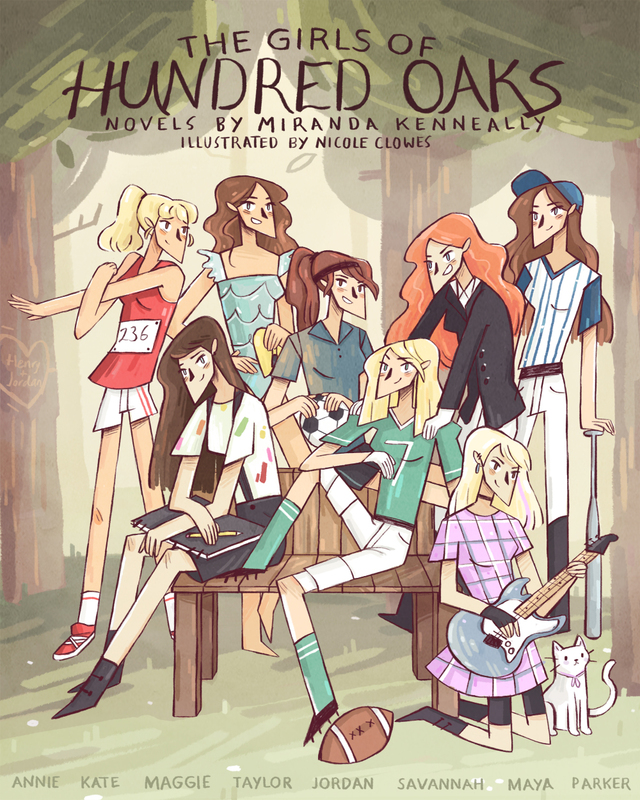 January 21, 2016 – Barnes and Noble Teen Blog Features the DEFENDING TAYLOR cover. December 8, 2015 – STEALING PARKER will be published in Hungary! December 1, 2015 – CATCHING JORDAN will be published in Poland! June 27, 2015 – Publishers Weekly gives Jesse’s Girl a great review! April 15, 2015 – Kirkus gives Jesse’s Girl a great review! December 5, 2014 – CATCHING JORDAN and STEALING PARKER will be published in Turkey! November 11, 2014 – Audiobooks for Catching Jordan, Stealing Parker, Things I Can’t Forget, and Racing Savannah were released. August 11, 2014 – Breathe, Annie, Breathe sells to France and Germany! July 29, 2014 – New two-book deal with Sourcebooks announced! July 15, 2014 – Booklist gave Breathe, Annie, Breathe a *STARRED* Review! July 11, 2014 – Read an interview I did with Publishers Weekly. July 3, 2014 – Audible will be producing audio books of Catching Jordan, Stealing Parker, Things I Can’t Forget, and Racing Savannah! June 17, 2014 – Catching Jordan will be published by Hungarian publisher Mora! May 2, 2014 – Publishers Weekly gives Breathe, Annie, Breathe a great review! April 25, 2014 – I spoke about revising your books at the Arlington County Library. Watch the video here. April 23, 2014 – Kirkus reviews BREATHE, ANNIE, BREATHE. December 18, 2013 – I guest-blogged on the Barnes and Noble Nook blog! November 26, 2013 – Booklist gives Racing Savannah a fantastic review! October 14, 2013 – Publishers Weekly gives Racing Savannah a great review! June 6, 2013 – CATCHING JORDAN German translation rights sold to Random House Germany. April 29, 2013 – Read Publishers Weekly’s Review of THINGS I CAN’T FORGET. March 6, 2013 – Read an interview I did with the Washington Post! 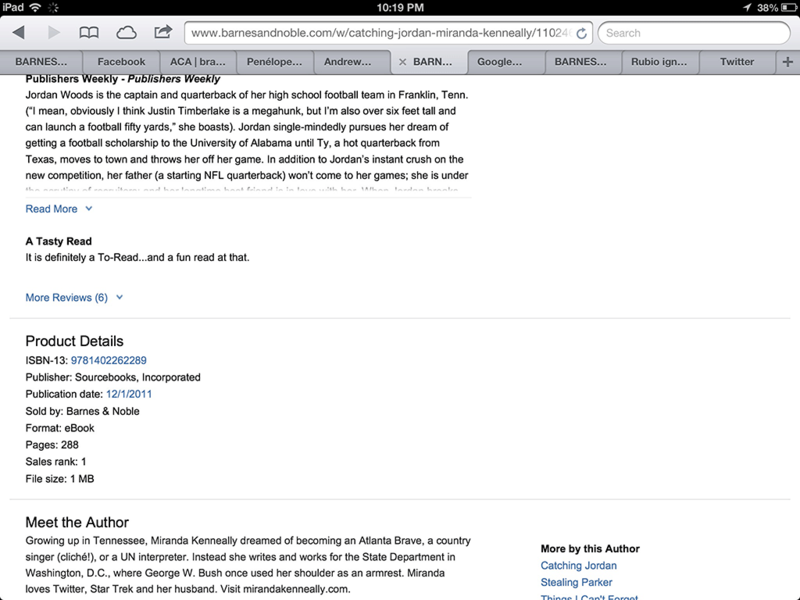 November 19, 2012 – CATCHING JORDAN hits number 1 on the Barnes and Noble eBook list! #1!! October 31, 2012 – CATCHING JORDAN nominated for a Goodreads Readers Choice Award! October 10, 2012 – Read the great review of STEALING PARKER from School Library Journal. September 24, 2012 – New three-book deal with Sourcebooks Fire! September 2, 2012 – Read great reviews of STEALING PARKER from Kirkus, Publishers Weekly, and RT. August 29, 2012 – STEALING PARKER mentioned in LA Times weekend section. August 7, 2012 – Read about Miranda’s Nationwide Tour with other Sourcebooks authors taking place November 1-10, 2012. August 5, 2012 – Read the first 25 pages of STEALING PARKER for free. August 5, 2012 – Miranda is participating in a School Library Journal online conference! August 1, 2012 – Cover for THINGS I CAN’T FORGET is revealed! July 9, 2012 – STEALING PARKER is named as a Junior Library Guild selection for Fall 2012. May 28, 2012 – Win an arc of STEALING PARKER! March 15, 2012 – CATCHING JORDAN film rights sold! February 26, 2012 – Read a new excerpt from STEALING PARKER here. January 20, 2012 – Watch me talk about CATCHING JORDAN on Virginia this Morning. January 15, 2012 – Read a deleted scene from CATCHING JORDAN here. January 6, 2012 – Check out the cover reveal for STEALING PARKER, a companion novel to Catching Jordan. December 22, 2011 – Ladies’ Home Journal gives a shout out to Catching Jordan. December 2, 2011 – CATCHING JORDAN is featured at Seventeen Magazine and CosmoGirl. November 15, 2011 – CATCHING JORDAN book trailer is live at Cari’s Book Blog. October 30, 2011 – CATCHING JORDAN is reviewed by Publishers Weekly. October 25, 2011 – CATCHING JORDAN receives a 4-star rating from Romantic Times! September 9, 2011 – I’m quoted in the Vermont College of the Arts Hunger Mountain “In Defense of YA” roundup. September 7, 2011 – Two-Book Deal with Sourcebooks Fire! August 3o, 2o11 – Dear Teen Me anthology sells to Zest Books! 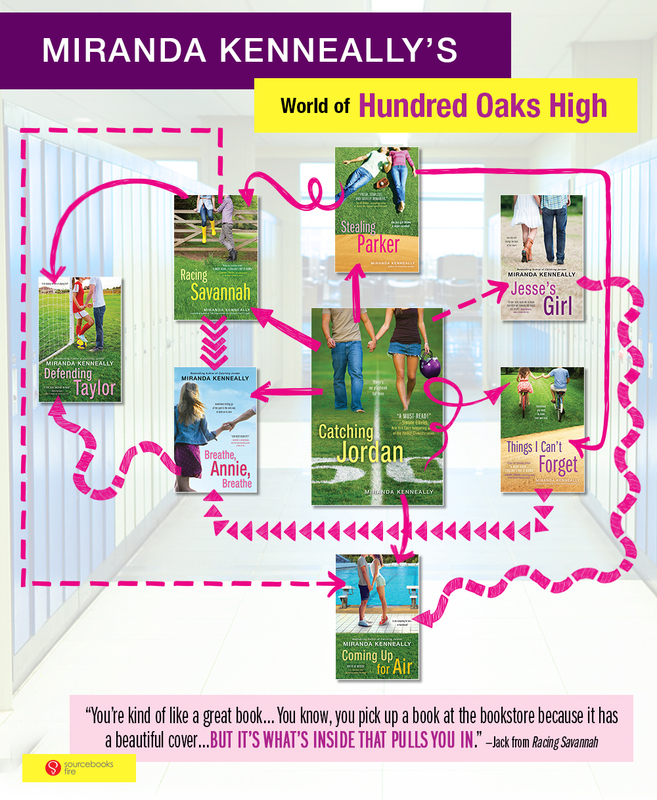 June 6, 2011 – Another of my favorite authors, Sarah Ockler, blurbs CATCHING JORDAN! June 3, 2011 – One of my favorite authors ever, Jennifer Echols, blurbs CATCHING JORDAN! May 4, 2011 – Guide to Literary Agents features my original query letter. April 14, 2011 – Bid on a 30-page critique from me and help benefit Brenda Novak’s Annual Auction for the Cure of Diabetes. March 8, 2011 – SCORE cover revealed! February 21, 2011 – SCORE is listed in the Fall 2011 Publishers Weekly Sneak Preview (under Sourcebooks Fire). December 1, 2010 – My friend E. Kristin Anderson and I launched Dear Teen Me! In less than 2 months, we’ve had nearly 10,000 visitors. October 3, 2010 – My blog post The Importance of Being Ridiculous is featured on the front page of Writer’s Digest Daily.